Creative Labs really wanted to kick off its new X-Fi sound card line with a bang, so the company contacted us here at bit-tech to build some systems to showcase its new pride and joy. 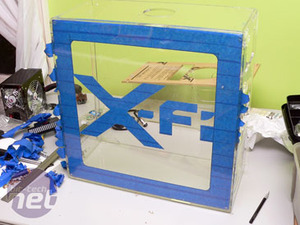 The X-Fi has three main modes: music creation, gaming and entertainment, and Creative wanted a system for each one. After a discussion with fellow mod-god Dave "Macroman" Williams, we decided he would do the music creation version, and I would do the gaming and entertainment systems. Talking to the guys at Creative about what they wanted us to make, they immediately said what most people say when you ask what custom computer they want - "Make me an Orac3". Unfortunately, Orac was something of a one-off - the mod took over a year from start to finish, as well as thousands and thousands of dollars. While I couldn’t recreate Pete’s genius masterpiece, I decided to pay homage to it and make something similar - but that would also be better equipped to show off Creative’s new baby. So, I started out by calling the guys at Clear Computer Case, or C3 for short. 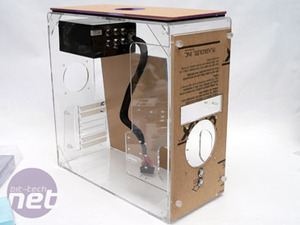 Pete had used one of their cases for Orac3 and I happened to know them, and live about 2 hours from their shop. They agreed to give me some assistance that would end up saving me a lot of time, which was critical. We started out with the basic premier model, and C3 was good enough to custom-cut some parts based on my specifications. 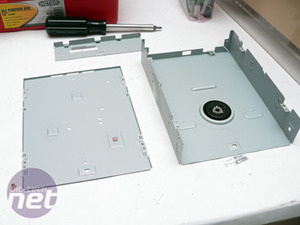 First, I needed a single rectangle cut for the optical drive. 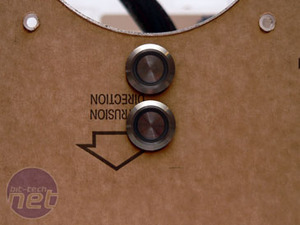 We also moved the 120mm intake fan and cut some holes for the Bulgin switches I planned to use. 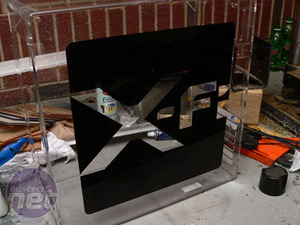 The guys at C3 also used their laser cutter to cut me a couple X-fi logos out of clear acrylic. Thanks, guys! 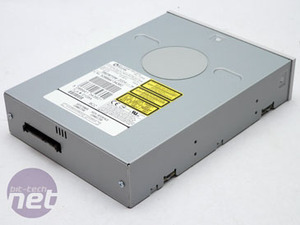 Given that we are using a clear case, I needed to dress up the Plextor SATA optical drive we are using. I could have painted it, but one of the great things about Orac3 is all the shiny goodness, so I decided to polish it. I started by disassembling the drive, removing all of the labels and then thoroughly cleaning it. Once the drive was clean, I sanded the panels with an orbital sander, and then followed up with wet-sanding by hand. 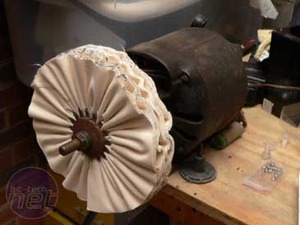 Next up, I loaded a new polishing wheel on my antique grinding motor. Using polishing dope, I started to work the panels on the wheel. This is a very long and tedious process. Having gone all the way to wet-sanding the surface beforehand really helps the polishing process along, since the smoother the surface, the easier it is to polish. After two days of sanding/polishing, I finally had the results I wanted. Because this was a fairly low-grade steel instead of something like aluminum, I figured it was smart to seal it to prevent the drive from rusting. 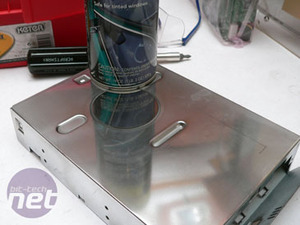 So, I shot a few layers of clearcoat onto it to preserve the mirror-like finish. While I had it apart, I also took the opportunity to vinyl dye the front bezel black. Once all of that was done, I put the drive back together and moved on. With the drive out of the way, it was time to wire up the two Bulgin switches, one blue and one red. The blue one is the power button, and will be wired to the power switch and power led headers on the motherboard. The red switch will be wired to the reset switch and hard drive led headers. 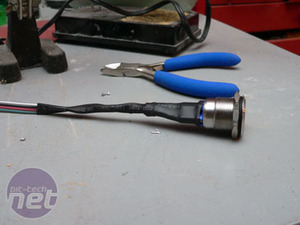 Later, I'll apply slome blue UV-reactive flex sleeving to cover the wires. Before I get to that, though, I decided to customize the motherboard side of the case to really brand this baby for Creative. I wanted a graphic representation of the new X-Fi GPU on the side of the system, and I think the motherboard side was the best place - the back of a motherboard isn’t the most attractive part of a computer. 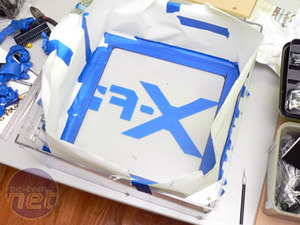 I took the blank from a piece that C3 used to cut the X-Fi logo, and used that as a template. After masking off the entire inside of the panel, I traced the logo using the blank. Since I was working from the inside of the panel, I had to lay the template out backwards so that the final design would be seen correctly from the outside of the system. I then cut the image out, leaving a paint mask of the logo. I'll soon apply vinyl dye to the inside, a method I first learned from Dave Williams in his Macro Black project and also used in my Cinemedia PC project. I love the look of this technique - I don’t think anything makes acrylic look cooler than back painting. 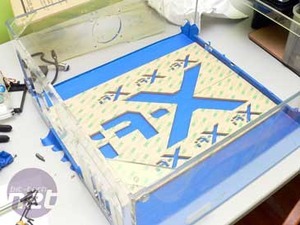 Before I got spraying, I needed to mask the rest of the interior of the case to protect it from overspray. After about 8-10 coats of black vinyl dye, I had the results I was looking for.